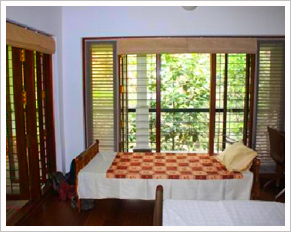 Colonel's Retreat is an exquisite home stay in the enchanting Mavady Hills in Kottayam District of Kerala, India. 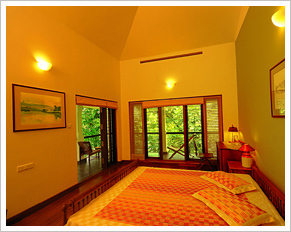 Lush greenery, sylvan ambience and unpolluted countryside give Colonel's Retreat an idyllic setting. Its location is strategic. It is the dead centre of a rectangle with its four corners depicting the four star tourist attractions of Kerala: Cochin, the queen of the Arabian Sea, Munnar, the beauty of a hill station, Thekkady of wildlife fame, and Alleppey of the bewitching backwaters. 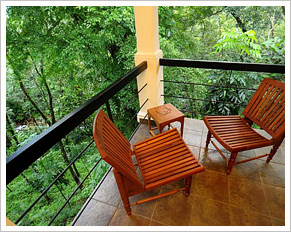 Colonel's Retreat at Mavady Hills offers exclusive premium home stay facilities for individuals and families in a couple of comfortable bed rooms with spacious private balconies, which are almost suspended in the foliage , and overlook the forest stream cascading over the rocks below. 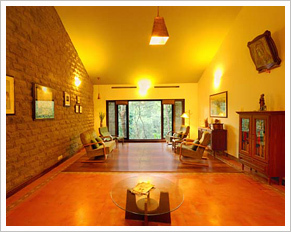 The Retreat has all modern amenities and is set in the picture-postcard surroundings of a sprawling plantation. The climate at Mavady Hills is salubrious throughout the year. Delicious home-cooked ethnic Kerala food with farm-fresh spices, vegetables and fruits is served. The fresh filter coffee is from their own plantation. Water served is from the natural spring located at site, and is so fresh and pure that not only can you savor its taste but also feel its softness as it foams through your hands. They have an organic farming environment modeled on the lines propounded by Masanobu Fukuoka of “The One Straw revolution" fame. They use no chemical manure. Organic manure is used. Vermi-compost is produced in the farm itself. The irrigation is done by rain harvesting thus saving energy. Solar panels are used for heating water. They use no air conditioners. Ten trees are said to give the effect of a 1 ton air conditioner. They have hundreds of trees all around Colonel's Retreat. They are surrounded by natural vegetation with so much to see and so many birds to watch. Television is neither required nor available. 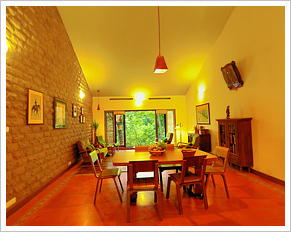 No musical system so that the guests can hear the natural music of the murmuring brooks and chirping birds. Only locals who would have otherwise remained unemployed are in the staff. 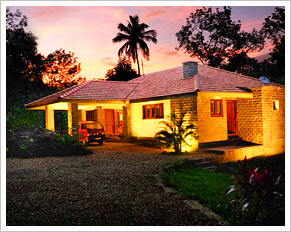 www.kerala.com www.Vagamon.com www.keralatravels.com Powered By Worldviewer Dot Com (India) Pvt. Ltd.